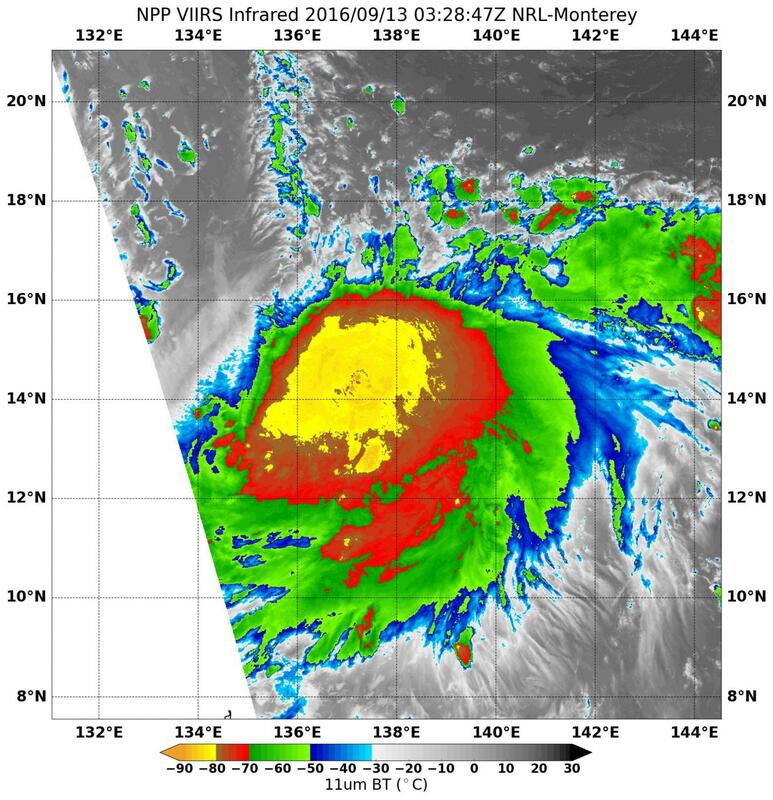 NOAA's Suomi NPP satellite measured cloud top temperatures as it passed over Tropical Storm Malakas in the northwestern Pacific Ocean and found strong storms. On Sept. 13 at 0328 UTC (Sept. 12 at 11:28 p.m. EDT) NASA-NOAA's Suomi NPP satellite passed over Tropical Malakas and measured cloud-top temperatures. The Visible Infrared Imaging Radiometer Suite (VIIRS) instrument aboard NASA-NOAA's Suomi NPP satellite captured an infrared image of the storm that revealed the location of coldest cloud top temperatures and strongest storms. VIIRS data showed cloud top temperatures of strong thunderstorms as cold as minus 80 degrees Fahrenheit (minus 62.2 Celsius) were found around the center of circulation. Temperatures that cold indicate strong uplift in the storm and cloud tops high into the troposphere. NASA research has shown that storms with cloud tops that cold have the ability to generate heavy rain. Tropical Storm Malakas, formerly known as tropical depression 18W continues to intensify. At 11 a.m. EDT (1500 UTC) on Sept. 13 the Joint Typhoon Warning Center (JTWC) said Malakas was located 842 miles east of Manila, Philippines. It was centered near 14.7 degrees north latitude and 135.5 degrees east longitude. Malakas had maximum sustained winds near 57 mph (50 knots/92.6 kph) and was moving to the west at 15 mph (13 knots/24.8 kph). The Joint Typhoon Warning Center forecast calls for Malakas to move west-northwest and intensify to typhoon strength. Later in the forecast period, Malakas is expected to turn north and stay far to the east of Taiwan on the way to Japan.